Welcome to the worlds greatest guide to Women's Leather Boots. Are you actually looking for Women's Leather Boots? A women's boot is a sturdy item of footwear covering the foot, the ankle, and sometimes the leg below the knee. Rounded toe, pointed toe, over-the-knee, ankle, block heel, high heel, and many more options are available for consideration. In addition to the styling options, the material is an important choice to consider when selecting a ladies boot. Leather is a material made from the skin of an animal by tanning or a similar process. Learn about the various types of leather grain that can be used for women's boots. Women's leather boots can be manufactured for fashion or for function (or both). Cowgirl boots are a fine example of leather footwear that can be both functional as we as fashionable. They can be worn while working on a ranch, or they can be paired with a dress. If you are planning on outdoor adventures, Apparel Search suggests that you search for finely crafted boots with waterproof full-grain leather that features a seam-sealed construction for maximum protection. Discover the latest styles of women's dress boots and booties from your favorite brands by shopping at your favorite retailer. You are almost sure to find a wide variety produced from fine leathers. 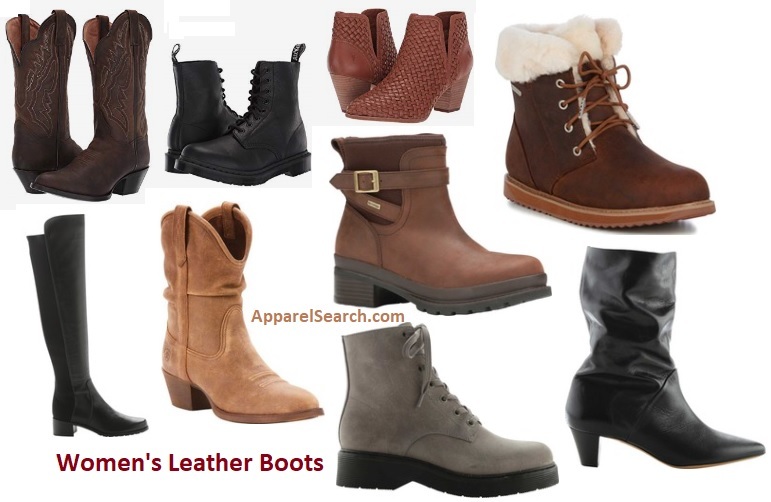 When you are done researching ladies leather boots, you may find interest in reviewing the following sections regarding footwear. Apparel Search is a leading guide to fashion, style, clothing, glam and all things relevant to apparel. We hope that you find this Women's Leather Boots page to be helpful. What ever style of boot you are wearing, is in fashion. You might also want to learn about other types of shoes from our footwear & fashion terminology section. If you want to be even more stylish, you should wear your favorite women's leather boots.